We’d love your help. 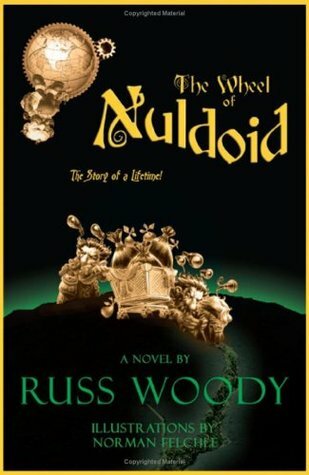 Let us know what’s wrong with this preview of The Wheel of Nuldoid by Russ Woody. New Fantasy/Humor by Russ Woody. Three humans journey to the center of the earth where a society of Hobit-like creatures live in a spherical town called Nuldoid and operate the machinery that rotates the earth. Woody is the Emmy and Golden Globe winning writer/producer of Becker, Mad About You, Murphy Brown, Cybill and many others. To ask other readers questions about The Wheel of Nuldoid, please sign up. Well, come on, I wrote it, so, yeah, five stars. Cliched characterization, cliched dialogue, cliched imagery, and an aggressive tell-don't-show policy crushed the life out of this story. It's regrettable, because there's something there--the author is a decent writer, better than the average self-published author--but the book needs strong, sharp editing that it didn't get. For example, one of the main characters is a teacher who wants to be good and engaging, but rules and regulations have ground him down into one of the boring teachers he hat Cliched characterization, cliched dialogue, cliched imagery, and an aggressive tell-don't-show policy crushed the life out of this story. It's regrettable, because there's something there--the author is a decent writer, better than the average self-published author--but the book needs strong, sharp editing that it didn't get. For example, one of the main characters is a teacher who wants to be good and engaging, but rules and regulations have ground him down into one of the boring teachers he hated so much when he was a boy. That's interesting! But do we get to see him teaching a class? ...No. Do we get to see his frustration at not being allowed to teach the way he knows his students need him to teach? ...No. We get to see him sitting around his house with his cat while the narration drones on about his history for several paragraphs. Even when he gets up and starts doing things, the narration gets in the way. The dialogue is clogged with it, the action sequences are padded with it. Every time something looks like it might happen, the narrator yanks on your sleeve and tells you what to think and why. Often the narrator is so busy telling you what to think that the action itself passes by in the background, and the narrator has to fill you in after the fact. So as you might have guessed, I'm focusing on the writing skills because the story... wasn't there. After four chapters, nothing had happened. Sure, there was an earthquake, but it didn't seem to matter. None of the characters seemed much bothered by it, even the two strange little creatures with Yooper accents who watched part of their city collapse. Nor did I like any of the characters; they were all frustrated, bored, annoyed, and annoying, mostly patterned on worn old types with little or nothing to give them individuality. I stopped reading after the fourth chapter because the characters and I were becoming too much of a oneness, frustrated, bored, and annoyed. 257 pages into it, I'm almost done. It's BRILLIANT. Russ is a flawless writer. I could eat his words all day long. Even better, they're fat free. I ran into Russ on Shelfari and decided to download the Kindle sample - what a charming beginning!! I definitely think this is "one to watch". I'm going to get a copy right away. I quite enjoyed my trip to Nuldoid. Russ Woody has a most intriguing imagination with a good dose of sentimentalism thrown in. The story reminded me in parts of Eoin Colfer's Artemis Fowl series and I could definitely see other stories about Nuldoid come from Woody. I liked the way he didn't talk down to a YA audience and used some pretty big words. It's good to introduce YA's to vocabulary, especially when the Nuldoid-speak is such a grammatical mess! But by the end of the book I could practica I quite enjoyed my trip to Nuldoid. Russ Woody has a most intriguing imagination with a good dose of sentimentalism thrown in. The story reminded me in parts of Eoin Colfer's Artemis Fowl series and I could definitely see other stories about Nuldoid come from Woody. I liked the way he didn't talk down to a YA audience and used some pretty big words. It's good to introduce YA's to vocabulary, especially when the Nuldoid-speak is such a grammatical mess! But by the end of the book I could practically speak Nuldoid myself, which really scares me. An AMAZNG book!!! It definitely takes you to another world, all inside our own. The writer does a fantastic job describing the universe the book is set and makes you feel for the characters. I loved the book and definitely put it in my collection as one of the best stories Ive ever read. Just couldn't get into it. I will pick it up again. i LOOOOOOOVVVVVVVVVVVVEEEEEEEEEEEEEEEEEEEEEEEEEE this book! i met th author and im curretnly awaiting his next creation!!!! First chapter was pretty funny but for some reason I wasn't in the mood. Will revisit sometime in future. Hold on. Why does it ask for my "Date of Death"? Here's a story behind the story! EFFED UP! Story Hold on. Why does it ask for my "Date of Death"? I've been a television writer/producer for about 25 years. Have been lucky enough to work on some great shows (Murphy Brown, Cybill, Mad About You, Becker, The Drew Carey Show, St. Elsewhere, Hill Street Blues)... and plenty of less-than-great (sucky) shows. I also have an Emmy and a Golden Globe. Like, I know, big deal.